Lock in a great price for Palia Maria Eugenia – rated 8 by recent guests! The hotel is nice, bright and clean. Its location is convenient as there is a small beach nearby and a market across the road although it is quite far from the airport (about 1h with a taxi for 75-80€ one way - you can also get a bus but be prepared for a very long journey). The staff was very friendly although a bit slow (long wait at the reception and bar). The room had a fantastic view of the sea. The garden was small but pleasant, the 'adult only' section was very quiet and relaxing and the infinity pools were great. 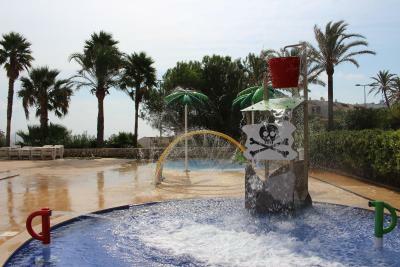 The staff were really friendly, lots of activities to do during the day and lovely pools and lounge areas. Overall a great stay, my boyfriend and I would definitely be coming back to stay at this hotel again in the near future. We stayed there for 14 days/nights, and we really liked it :) The staff were very friendly and almost everyone could speak english. The rooms were big and lovely with a balcony. 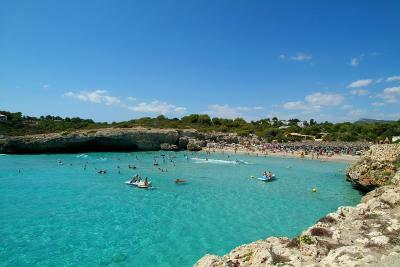 There were 4 pools and many sunbeds (extra like for this), which often are hard to get. There was also an area for children with swings etc and also an area only for adults. This way it was nice to get time to relax without all the noises from children :) The entertainment was good and there was always a good atmosphere. - The food was good, and extra good that you could see the chefs make the food in front of you. The beach is 5-7 mins away, and another one 10-12 mins away. There are many shops right next to the hotel, and easy to buy tickets to things like; waterpark, car rental etc. Staff were excellent from reception to the bar staff. Food was very good with lots of choice. Staff friendly and helpful enough, all clean, close to two very nice beaches, cocktails are nice and strong, San Miguel on draft, odd little thing to break up the day if you were just by the pool like archery/air rifle shooting/pool/ ping pong/tennis, shower was nice and big, room was large had a proper double bed two singles and a sofa the size of a single bed, bloke made fresh pizza at dinner most days, there's an Indian and a Chinese in the complex opposite the hotel near the mini golf with a zoo (a few chickens) both were gorgeous and reasonable when you want a change from the all inclusive. Palia Maria Eugenia This rating is a reflection of how the property compares to the industry standard when it comes to price, facilities and services available. It's based on a self-evaluation by the property. Use this rating to help choose your stay! Set on a cliff with incredible sea views, Palia Maria Eugenia is 1,650 feet from Cala Domingos Beach. Facilities include a tennis court, sauna and several pools including an Olympic-size pool. 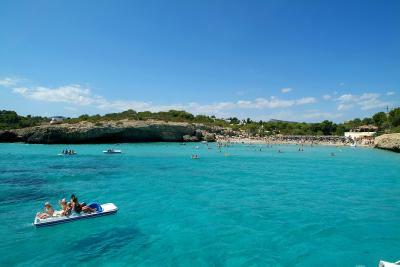 Hotel Maria Eugenia is 6.2 mi from Porto Cristo, on Majorca’s east coast. The hotel is set in lush gardens, with palm trees and sunbathing areas. Each room at the Maria Eugenia has air conditioning and a balcony, many with sea views. Rooms are bright and spacious, and come with a flat-screen satellite TV. The hotel serves fresh Mediterranean food in its buffet restaurant. There is also a poolside lounge bar and a reading room. Palia Maria Eugenia has a basketball court, as well as a gym. The varied activity program includes archery and fitness classes. In summer, children between 4 and 12 years old can have fun in the kids club. When would you like to stay at Palia Maria Eugenia? This bright modern room offers air conditioning, a balcony and flat-screen satellite TV. There is a rental safe and a private bathroom with a bath tub. House Rules Palia Maria Eugenia takes special requests – add in the next step! Palia Maria Eugenia accepts these cards and reserves the right to temporarily hold an amount prior to arrival. FREE WIFI!!! This was so dissapointing, that you had to pay extra for wifi everyday.... The staff worked hard, but sometimes they stood in front of you waiting for you to finish the food.. The dishes and knives/forks were often dirty, so they could wash it better!! There could have been one more elevator, because the two were always full. The cleaning ladies should learn english, so they could understand you. The tv could have english language and not only spanish, because you can't understand it. The food and drinks were terrible. Very low quality products, no variety every day the same, the chepest things they could find. Alkohol is also bad. Coktails were premixed from a machine. It corresponds to a 2 star hotel and not 4. One girl from the entertainment team, Paloma, was super rude and arrogant. Offending you in your face in Spanish thinking you dont understand. making very offensive rude jokes, that would upset you not make you laugh. So be prepared for some abuse from her. Wi-fi could be a lot better. Facilities for disable people need to improve. Food was super bad, and most of the day even raw food was present to us. Some days we even went out for lunch outside of the hotel as we could not eat their food. Entertainment was also very poor, so also we went outside of the hotel everyday and every night. In resume, we only sleep and used the pool few time, and the rest of the time we went outside. We most defiantly won't come back. Staff are super nice and helpful.